Constable was born on June 11, 1776 in East Bergholt, Suffolk, England. He is considered as perhaps the greatest English landscape painter, in the naturalistic sense of this art form. He was brought up in the typical English country side. Most of his boyhood was spent in the Stour Valley in Suffolk. His father, Golding Constable, was a wealthy corn merchant who had a couple of water mills and 90 acres of farm land. Today, this genius has been acknowledged throughout the world, but during his own lifetime, landscape painting as an art form was unfashionable. He was forced to struggle for recognition and his earnings were meagre. 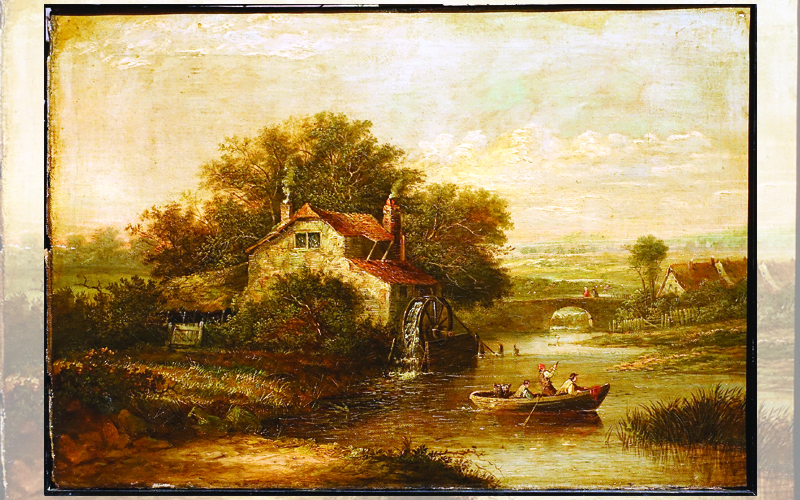 Constable was never successful in terms of financial rewards. He could not become a member of the establishment of artists in the United Kingdom until he got elected to the Royal Academy at a late age of 52. His work became more popular in France than it was in his native land, England. He sold more works in France and went on to inspire the Barbizon School of Art. When he chose art as a profession, he left his Suffolk home and moved permanently to London. The two greatest artists from England, Constable and Turner studied together and were rivals at one time at the Royal Academy. One of the most important decisions an artist makes is about his or her stance at the time he or she paints or sketches. The selection of a viewpoint has a deep impact on the finished painting. Constable had the habit of standing high above the levels of the scenes that he painted. The effect of this high stance was to provide an overview, in which distant objects were seen clearly by the people viewing the paintings. When he adopted a lower viewpoint as in the case of his masterpiece, Landscape by the Hay Wain; the distant objects were not clear any longer but they merged into the background. The idea was to involve the viewers with the scene in the foreground so that their focus is on paying attention to the main subject. Hay Wain was painted in his London Studio during the winter of 1821. He used his diary sketches and his oil studies as his reference material for this painting. He chose a landscape that he knew well, from his childhood. He was anxious while imparting those accurate details. The true subject in this painting is the time of the day, as the painter carefully studies the shifting summer clouds while projecting the play of sunlight on the meadows and trees. Constable observed the sky with unusual care and made detailed oil studies, often noting down the exact time of the day that he sketched at. He even paid attention to the speed of the wind and its direction. A longer viewpoint as presented in the Salisbury Cathedral highlights the drama of that particular subject. It allows the soaring spire of the cathedral to be framed within an archway formed by the trees. In his other famous painting, The Stonehenge, the low viewpoint combines with a bare horizon, indicating that much of this painting is taken up with the dark blue sky as if to say that the background features as a mystery for these ancient stones. His masterpieces and the circumstances that surrounded them John Constable is well known for his masterpieces such as his paintings of The Grove, Flatford Mill, Hay Wain, Salisbury Cathedral, and Stonehenge. The Hay Wain can be found at the National Gallery. 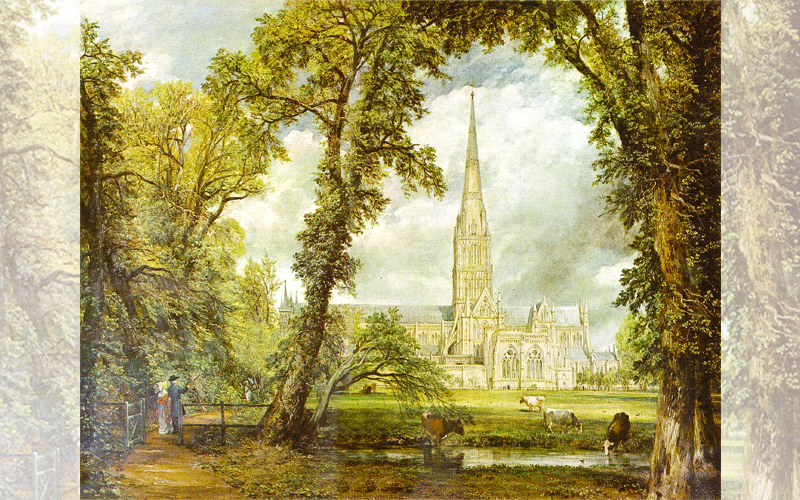 His other famous painting, Salisbury Cathedral was commissioned in 1823 by the Bishop of Salisbury. While Constable was busy with his sketches in his favourite Suffolk countryside, dramatic news was breaking in from the world around him. The King of England, George III, had turned mad and control of administration shifted to his son, the Prince Regent – King George IV. The long struggle and the war against Napoleon went on with catastrophic consequences for the economy of Britain. In 1812, England experienced many weeks of depression and riots. In the same year, Edward Jenner became famous as a pioneer in discovering a vaccine against small pox. A sequence of victories by the Russians against the French weakened the armies of Napoleon and he met his nemesis in the Duke of Wellington at Waterloo. 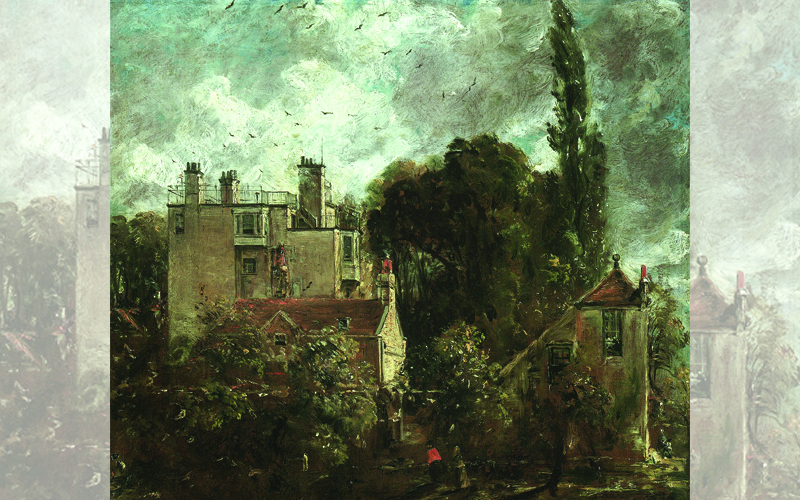 All these events had a big effect on the work of John Constable; he continued seeking refuge in his art while the world was going up in flames. Constable died at the age of 61 when he contracted pulmonary tuberculosis. He is remembered for being a rebel against the artistic culture of his times which taught artists to use their imaginative powers to compose images instead of gathering them from what nature had to offer. Constable is well known for his use of water colours; he used them freely for his time. An example of this is found in his masterpiece, , painted in 1835 where he portrayed the double rainbow. This particular painting is regarded as one of the greatest in the use of water colours.